A ‘secondary target’ is the one against which weapons are directed when the main fire mission in a military operation has been accomplished, or when it has become impossible or impracticable for the gun or battery to carry out such a mission. A notorious example is the US military’s spraying of Agent Orange on Laos and Cambodia after troops had completed sorties in Vietnam with surpluses of the herbicide to spare. 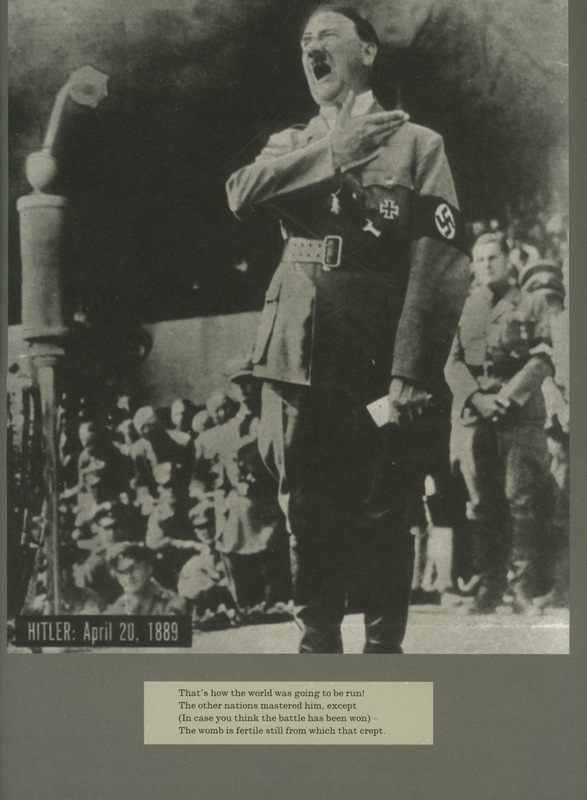 This paper critiques War Primer 2, a book by the artist duo Adam Broomberg and Oliver Chanarin, a response to, and intervention into, Bertolt Brecht’s 1955 photo-book War Primer. My argument is that War Primer 2 puts into practice certain aspects of Brechtian theory that are not fully present in the original work. War Primer is a collection of newspaper clippings of World War II photographs, under which Brecht has placed his own ‘heroic’ quatrains: four line poems with an abab rhyme structure. A ‘primer’ is an elementary textbook that serves as an introduction to an area of study: Brecht clearly envisaged a didactic function for the book. A short passage from the article he wrote in the 10th anniversary issue of the Berlin-based Worker’s Illustrated News in 1931 gives a good indication of his aims for the project. Brecht states that, in the hands of the bourgeoisie, photography has become a ‘weapon against truth (…) The immense quantity of images that is spewed out daily from the printing presses and appears to bear the stamp of truth in fact serves merely to obfuscate the way things are.” J.J. Long asserts in his article, ‘Paratextual Profusion: Photography and Text in Berthold Brecht’s War Primer’ that the majority of literature on this work takes the position that the book essentially provides a Leninist corrective to such obfuscation. War Primer 2 treats John Willett’s English language translation of the original book as a sequence of ready-mades, layering onto Brecht’s monochromatic pages a further series of full-colour images of the ‘War on Terror’ that the artists sourced from the Internet. But this is not simply a digital collage of the contemporary and original images. In this limited edition artists’ book, the upper layer of images are printed on physically separate pieces of paper to the Brecht originals. The effect is to recall the scrapbook nature of Brecht’s original compilation: whilst in some repects a slick, polished work, its actual construction invites us to consider it as we would consider all scrapbooks: provisional and open to correction. In Museum of Words, James Heffernan offers a very broad definition of ekphrasis: ‘the verbal representation of visual representation’. 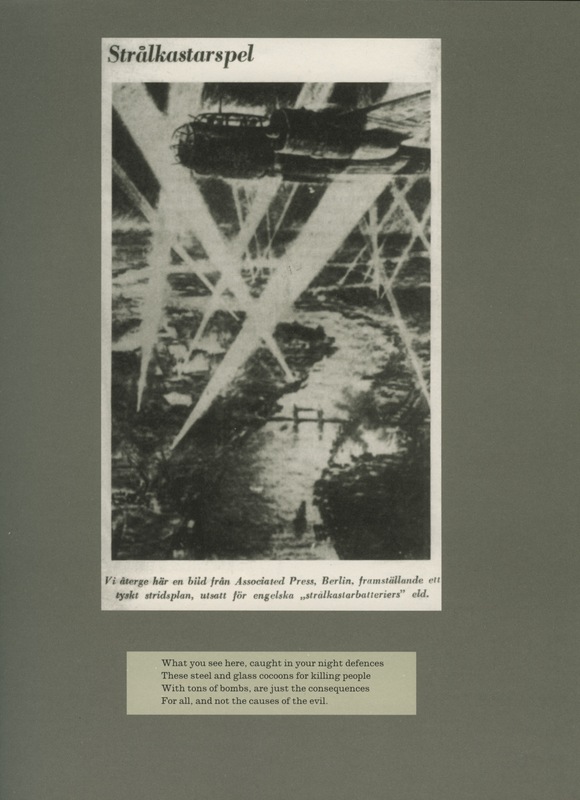 Not every plate in the original War Primer uses ekphrasis, but in the same expansive spirit as Heffernan, I would like to propose here that if such a work is read as Brecht intended, then the whole of the reader’s experience, and not just the author’s original poetry, constitutes an extended form of ekphrasis. Whilst the reader’s mind obviously takes in an image via its visual characteristics, if she is to ‘read’ an image in the way Brecht espoused, there will be a kind of parallel, verbal recital, an inner act of ekphrasis and critique that also takes place: I will refer to this effect here as an inner ekphrasis. Brecht’s poems occupy varying registers, from that of omniscient narrator to a more playful envoicing of the figures within the pictures. As might be expected with a primer, the work is difficult to read in one continuous sitting. 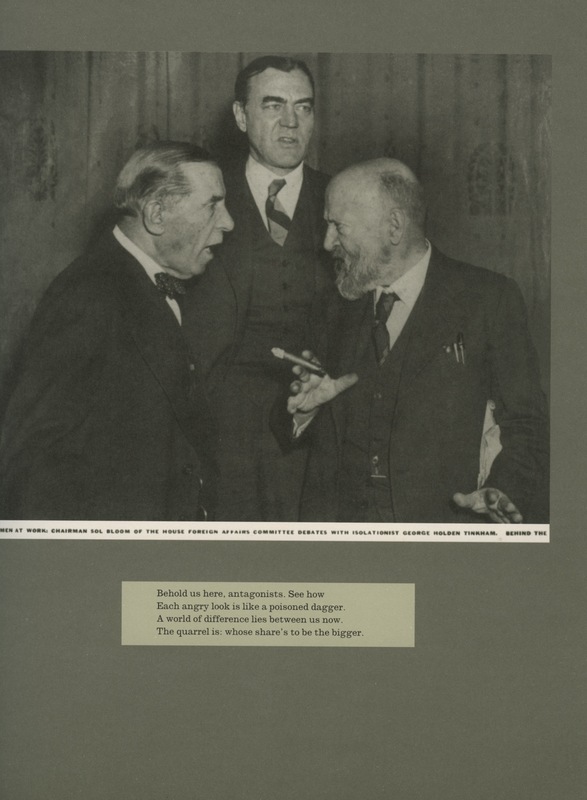 Although they loosely follow the chronology of the war, each photo-epigram easily stands alone. The affect of each page is more powerful in a single dose. David Evans, in his article ‘Brecht’s War Primer: The “photo-epigram” as Poor Monument’, supports this approach of reading each plate as a singular work. He draws parallels between Brecht’s quatrains and the uses the Ancient Greeks made of the epigram, or ‘epigraph’ in funerary rites, inscribing this laconic poetic form onto stone monuments. But to draw this parallel is also to acknowledge that Brecht’s poems, in part through the very limits of their form, circumscribe his project in a way that was perhaps at variance with his intentions for it, and that short circuits the potential for any inner ekphrasis in the reader. I argue below that War Primer 2 reopens the text, bringing it paradoxically closer to Brecht’s aims than the original. There are three ideas I would like to introduce before discussing War Primer 2. These are Jörg Heiser’s concept of ‘Romantic Conceptualism’, Roland Barthes’ theory of the ‘studium’ and ‘punctum’, and Brecht’s own notion of Verfremdung, variously translated as the ‘de-familiarisation’ or ‘estrangement’ technique within his conception of theatre, and which extends to his work in poetry and collage. ‘Romantichscher Konzeptualismus’, which Heiser curated at the Kunsthalle Nürnberg in 2007, and his accompanying book of the same name, posited that a significant number of first generation conceptual artists engaged with the Romantic tradition. Heiser suggests that works by Warhol, Jan Ader, Smithson and others provide an ‘emotional kick’ where we might have expected only dry formalism. ‘Emotional Rescue’, an essay he wrote five years earlier, sets forth the germ of this idea: Andy Warhol’s 1963 film Kiss is interesting because of the simple originality of its concept (a number of couples kiss in front of a fixed camera) yet gripping because of its details. We could compare this distinction to the ‘punctum/studium’ relationship that Roland Barthes proposes in Camera Lucida. For Barthes, for a photograph to be memorable, it must contain a studium, a general field of interest, such as location or genre, and a punctum, a point of rupture, a ‘pricking’ detail that galvanizes the viewer’s attention. To apply the idea to War Primer, we must necessarily extend the studium beyond the frame of the single photograph. And if we can extend the idea to moving images, the studium in Warhol’s Kiss might be the act of kissing, whether considered from an anthropological, romantic, or any other viewpoint. Its puncta are the numerous unpredictable, human details Heiser enumerates: the ‘closed eyes and short, excited looks.’ Heiser proceeds to question Sol LeWitt’s assertion, in his essay, ‘Paragraphs on Conceptual Art’, that a conceptual artist’s work must be ‘dry’ (i.e. in opposition to the ‘emotional kick’ provided by Romantic and Expressionist art) in order to become ‘intellectually interesting’. As Heiser reframes it, ‘charging a concept with an emotional investment (…) might focus rather than distract.’ Heiser’s aim is not to undermine Conceptual Art’s claims to originality, but to argue that its roots lay in earlier European thought. For example, he points out that a concern with systemization was present from the inception of Romanticism. August Wilhelm Schlegel wrote at the turn of the 19th century, that art is ‘an intentionally determined utterance, or clearly thought delimitation’ but also asserted that it is ‘equally deadly for the mind to have a system and to have none.’ Schlegel was famously preoccupied with open process and fragmentation, but not at the expense of an overall sense of meaning. Mending this split, between chaos and order, or as Heiser puts it, ‘(adjusting) the mind to a contradictory order’, has been central to the Romantic project and, despite first impressions, has remained so to avant-garde practice. There is a vast body of critical writing devoted to Brecht, and he wrote a great number of theoretical texts himself. For the purposes of my critique, I would like to offer only Peter Brooker’s definition of the term Verfremdung. In Key Words in Brecht’s Theory and Practice of Theatre, he writes that ‘the term “alienation” is an inadequate and even misleading translation (…) The terms “de-familiarisation” or “estrangement”, (…) give a more accurate sense of Brecht’s intentions. A better term still would be “de-alienation.”’ The jerky shifts in scene and exposition of the technical apparatus that we find in Brecht’s Epic Theatre have clear parallels in the War Primer. The mid-grey background onto which the epigrams and newspaper clippings are pasted are pointedly artless, suggesting a scrapbook or diary. The form provides a visual prompt for the reader to engage in the work of inner ekphrasis. To become de-alienated, she must, following Brecht’s example, repeatedly describe the image afresh for herself, and in so doing, keep that reading provisional, unfixed and alive. Plate 24 of Brecht’s work shows a view of the Thames during the Blitz. A German bomber hovers ominously above an atmospheric view of Tower Bridge, impervious to the criss-crossing lines of searchlights below it. Underneath is the following quatrain: What you see here, caught in your night defenses/These steel and glass cocoons for killing people/With tons of bombs, are just the consequences/For all, and not the causes of the evil. Brecht warns us not to invest the machinery of war with too much significance and to consider the invisibility of power and of evil. Broomberg and Chanarin’s addition updates this vision of aerial warfare, underlining how the nature of that invisibility has changed. A still of CCTV footage from an airport security screening room replaces the German bomber. We have shifted from an age where air travel is the preserve of the military and the very rich, to one where it plays a major role in tourism, and is fraught with post 9/11 paranoia. If plate 24 in War Primer is perhaps too pat, too self-contained, then the addition in War Primer 2 of the CCTV overlay provides a suitably de-alienating effect. If we now recall how broad a definition the Ancient Greeks gave to ekphrasis (relating one art form through the means of another), then we might even say that there is not only the verbal/visual relationship at play here, but a visual/visual play operating as well. 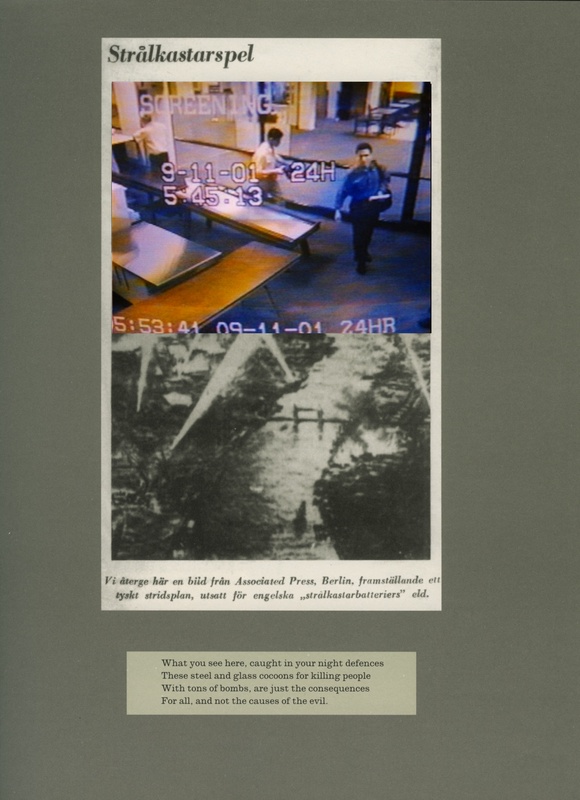 The means of production of the top image – stilled, digital, colour CCTV footage converted into offset printing – are markedly different to that of the lower: analogue, monochrome photography made using multiple negatives, converted into a digital file which is in turn made into offset printing. We are left hanging: Brecht’s original is opened up. The knowledge we can bring to bear on the new collage (the stringency of contemporary airport security) floats the image between our understanding of its semiotic (but not spatial) sense, and our uncertainty regarding the evil that lurks behind it. 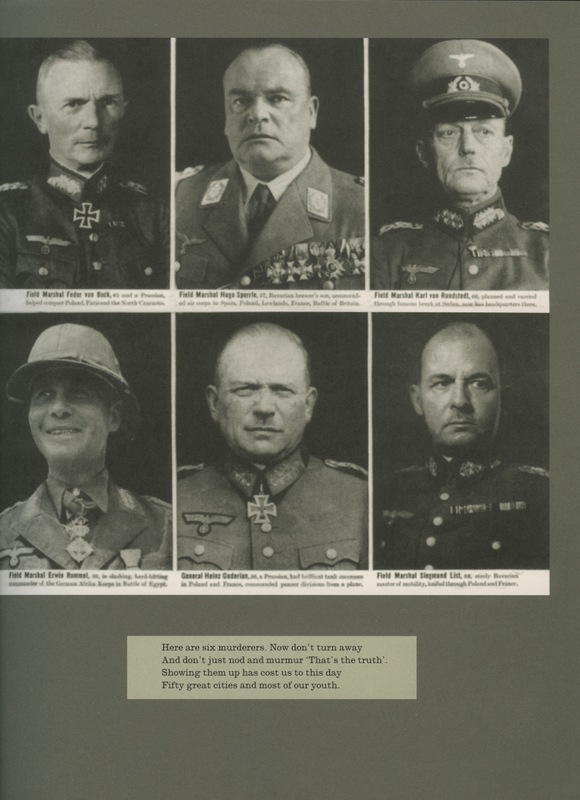 In plate 40 of the original, six studio headshots of Nazi leaders are placed side by side in a three-column grid. The epigram reads: Here are six murderers/Don’t turn away, and don’t just nod and murmur, ‘that’s the truth’/Showing them up has cost us to this day/Fifty great cities and most of our youth. Here, Brecht anticipates the reader’s ‘compassion fatigue’ and the possibility of her ignoring the picture because the men, it would appear, can be so easily condemned. The gambit of War Primer 2’s update of the plate might at first appear to be obfuscation. Whereas the War Primer gives us images loaded with Nazi insignia that we can place easily within a Manichean rubric, we now have no such recourse. 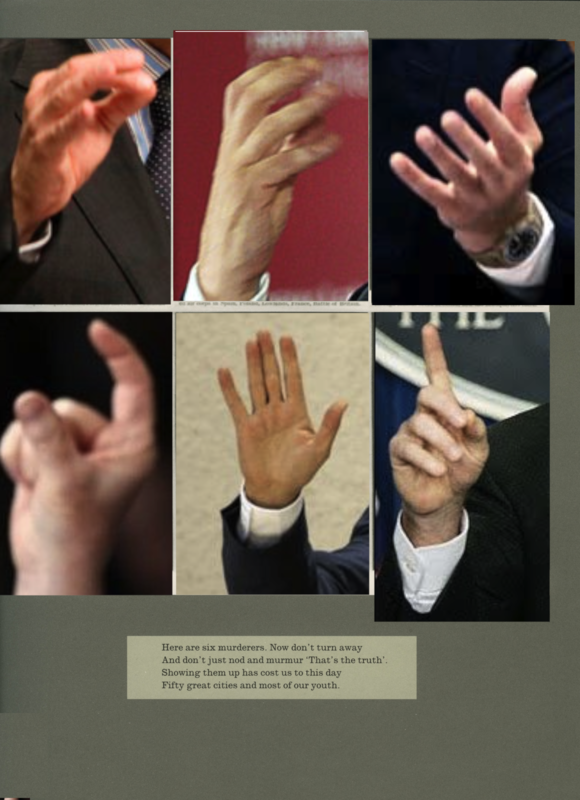 The hands might belong to any political or business leader on earth. And Broomberg and Chanarin’s crops suggest that there might be no essential difference between the signs given by an American senator or a Libyan terrorist. To read this work with Heiser’s and Barthes’s ideas in mind is instructive here. On a certain level, War Primer 2, even more than War Primer, has affinities with some of the key works of Conceptual Art: think of Ed Ruschas’s 1963 book Twenty-Six Gasoline Stations, for instance. The stations look practically identical: there is minimal variance from one page to the next. Here, seriality is used both as formal construct and as a suggestion of a political horizontality: the non-choice at the heart of capitalism. Although the hands in Brecht’s original plate are framed by a minimalist grid, the gestures themselves form a dancing, hypnotic screen, which we need to look beyond or above. For me, the punctum, the emotionally animating detail, here is the hand in the bottom left corner. It is poised, caliper-like, to measure the negligible distance that probably exists between the multiple political positions that the other hands spell out. Plate 45 in the Brecht work shows three men with the caption: ‘Men at Work. Chairman Sol Bloom of the House Foreign Affairs Committee debates with isolationist George Holden Tinkham. Behind the…’ The rest of the caption is cropped off. Below, it, Brecht’s text reads: behold us here, antagonists. See how/Each angry look is like a poisoned dagger. /A world of difference lies between us now. /The quarrel is: whose share’s to be the bigger. 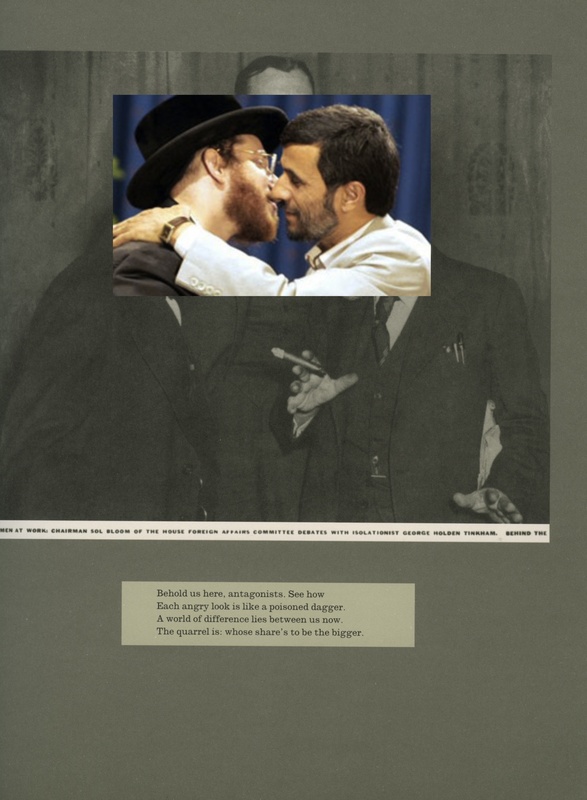 Over the faces of the American senators, Broomberg and Chanarin have pasted a photograph of Iranian President Mahmud Ahmadinejad, a vehemently anti-Semitic leader known for his fervent denial of the Holocaust, kissing an Orthodox Jew. War Primer 2’s footnotes reveal the other man to be a representative of the ‘Jews Against Zionism’ group in New York, so the picture is less ironic than it at first appears. But the obvious suggestion made by the juxtaposition is that no significant progress has been made in the Middle East in the sixty years that separate the two photographs. To draw on Heiser and Barthes again, it is as if the studium that the text and images offer is the perhaps endlessly contested territory in the Middle East. As with the Warhol film, the punctum and emotional ‘punch’ of the composite picture lie in the shocking detail of the unexpected kiss. Momentarily, Ahmadinejad’s eyes seem closed not because of icy, aloof diplomacy but in a sensuous apprehension of the kiss to come. The collaged, fragment quality of Brecht’s Primer invites us to ‘dip in’ and with a magazine, rather than make a linear reading. So rather than a linear reading, her progress might follow, for example, a loosely chiasmic pattern of plates 1, 85, 2, 83, 4, 80, etc. Of course, the realities of even the most docile reader’s experience are likely to be more complicated than this. It might help here to think of the horizontal, rhizomatic thought structure that Deleuze and Guattari propose in Capitalism and Schizophrenia, whose ‘antigenealogical’ nature they contrast to the arborescent structure, with its concern for end points, in use within Enlightenment thinking. Certainly, the rhizome would appear to parallel the structure of the Internet, and to some degree, by extension, map any user’s experience of it. But in terms of the reading subject, she must retain some teleological sense of convergence, or end-point, for there to be any motive to reading in the first place. Even if our aim shifts as we read, in most cases, we still need an aim as readers. And in ekphrasis, there is still a binary opposition at play: between image and text, or in the case of War Primer 2, multiple images and text. So it might be useful to think of the chiasm, (even if only as a base, with frequent diversions from an actual chiasmic structure) as one appropriate reading pattern for War Primer: even more so for War Primer 2. Reading is, for Brecht, a dialectical process. The engaged political subject uses the press not to reassert their unthinking beliefs, but to subject themselves to a continual process of renewal. She looks and reads, acts in the real world, returns to her reading and looking, and the cycle repeats itself. Images reflect text and experience in a changing model of perceptual growth and refinement. By analogy, picture the effect created by two mirrors, one normal and one tinted red, when placed in front of one another. Each repeated reflection will be of an ever-varying shade of red. Thus the engaged reader modifies and recalibrates her point of view. A number of photographic and textual fragments throughout each book could be said to provide the puncta or affects that activate the overall works. And if conceptual art places a strong emphasis on the notion of the viewer completing the work, then Heiser’s point seems to be that an ‘emotional kick’ might be the very precondition needed for a sustained, sophisticated dialogue with, and hence, a completion of, a work of art. War Primer 2 compounds a similar idea at the heart of the original War Primer, that the book itself is only a starting point for the reader. Through deceptively simple over-layering, Broomberg and Chanarin suggest that this process becomes perhaps more demanding, and all the more necessary, as time goes on. Heiser also brings his reading of Schlegel to bear on his interpretation of conceptualism. The modern subject, rather than expecting the work of art to enshrine classical ideals such as beauty or harmony, must instead adjust his or her mind to the inconsistencies and complexities proposed by it. We can find echoes of this sentiment in Brechtian Verfremdung, which is itself at play within War Primer. Brecht’s project presents a continuous stream of images that have been ‘corrected’ by the dissident timbre of his quatrains. As a formal exercise, War Primer 2 might be considered rather slight: But as a reification of Brecht’s imperative to treat images critically, Broomberg and Chanarin’s book is exemplary. What Brecht’s work suggests and Broomberg and Chanarin’s compounds, is not that we discredit the role of the photographer in itself, but that we pay it the respect of subjecting it to critique: of keeping it alive, of reanimating it. Whilst the range of news media might already have felt comprehensive to consumers in the second world war (the radio, the newsreel, the newspaper) the advent of the Internet, ‘rolling news’ and 24/7 reporting makes the task of treating political imagery sceptically even more important, and even more challenging, today. How does one confront such a glut of images, without yielding to compassion fatigue? There might at first appear a laziness, or even a political naivety to many of the individual plates in War Primer 2. But the work is perhaps more than the sum of its parts. It highlights the very need for us political subjects to remain active and vigilant. In a sense, to update the War Primer is an impossible task: the dominant visual mechanics of war have changed and sped up to an almost unrecognizable level, and have of course shifted from print to screen-based media. But every user of the Internet automatically creates a scrapbook in the form of their ‘user cache’ as they surf the web. The process is analogous to images lodging in the short-term memory, soon to disappear. War Primer 2 augments Brecht’s project, dramatizing the necessity that we all keep scrapbooks, mental or otherwise, ready to be added to or expanded. David Evans theorises that Brecht’s photo-epigrams are ‘poor monuments’, whose very material flimsiness serves as ‘an aid to critical remembering.’ But the lapidary nature of the texts also have the effect of sealing off the work as a whole, so that the enterprise becomes perhaps more hermetic than Brecht intended, at odds with the scrapbook-like nature of its purpose and design. The service Broomberg and Chanarin do to Brecht’s project is one of literal and metaphorical reopening. The imperative suggested by War Primer 2 is that we remain aware of the scrapbooks we are all creating, both consciously and unconsciously, and that we keep them open, ever ready for adjustment. Brecht’s techniques suggest ways of picking apart images that are complemented by such theoretical strategies as those employed by conceptual artists and by post-structuralist writers like Barthes. Broomberg and Chanarin employ both here. War Primer 2 reminds us that we continue to need images, but we also need to keep looking behind and beyond them.